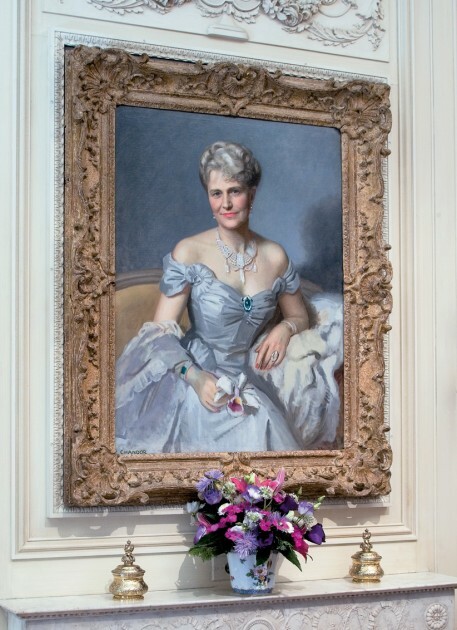 Marjorie Merriweather Post was an art collector in the mid-20th century. In 1955, Post purchased the estate Hillwood in Washington, DC to house her large art collection. Hillwood is one of the “collection museums” that I listed in an earlier post. The museum has a short introduction film on their website which is as fabulous as the tag line for the museum: Where Fabulous Lives. Early in life, at the young age of twenty-seven, Marjorie Merriweather Post became the heiress of the Postum Cereal Company (later known as General Foods Corporation) in 1914. Many biographers have commented on how Post was thrust into a “man’s world” of industry and business at a very early age.1 Several years after inheriting the family company, Post began to acquire furniture and decorative art with the help of art dealer Joseph Duveen. Interestingly, Post developed a keen interest in art during the same period in which she pushed for her business to merge with Birdeye Frozen Foods. Post’s art collection and museum can be interpreted as a self-portrait of Post, visually emphasizing her approachability, gender and femininity in order to draw a contrast with her perceived “masculine” pursuits in business. 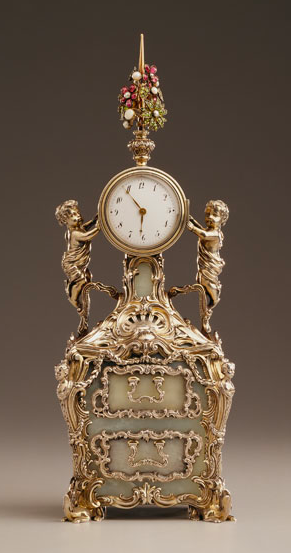 Clock, 1896, silver gilt, bowenite, watercolor on ivory. Height 11.25", width 4"
The works that Marjorie Merriweather Post collected seem eclectic and even disparate at first glance: she was interested in French decorative arts from the 18th and 19th centuries, porcelain, jewelry, objects from imperial Russia, Farbergé, costumes, and even Native American art. However, when analyzing Post’s collection, one can see the majority the collection requires the viewer to interact with the objects in a similar way. Many of the items in Post’s collection are created on a small-scale, which require the viewer to examine the finely detailed objects at an extremely close distance. It has been commented that Post was considered to be intimidating and off-putting to many people, because she gave the impression of “being very grand.”2 In one sense, Post’s art collection reflects and even extends this idea of grandeur, since the objects are very fine, luxurious, and extremely expensive. However, Post’s collection of small, dainty objects also presupposes an environment of familiarity, approachability, and even intimacy. In turn, one can assume that Post wanted to have these characteristics extended to her own persona. Post wanted her objects to be seen up close, and perhaps used these smaller objects to creatively assert that she, as an individual, was also approachable. The interior decoration and collective effect of the display contribute to the sense of femininity at Hillwood Estate. Such femininity is particularly manifest in the French Drawing Room, which is designed to “evoke the splendor of the French aristocratic life from the 18th century.” Such objects, particularly those from the Rococo period of 18th century France, historically have been considered “feminine” in nature. Art historian Melissa Hyde has stated, “During the second half of the eighteenth century, the rococo qualities exemplified by the work of [the artist] Boucher – grace, plenitude, emphasis on the seductions of color…came to be identified exclusively with the feminine.” Post includes a tapestry by Boucher in her drawing room, which compliments the flowery objects and lyrical decorative lines that suggest plenitude and grace. Such femininity can be seen in the rugs, chairs, and even the gilded molding of garlands on the wall. 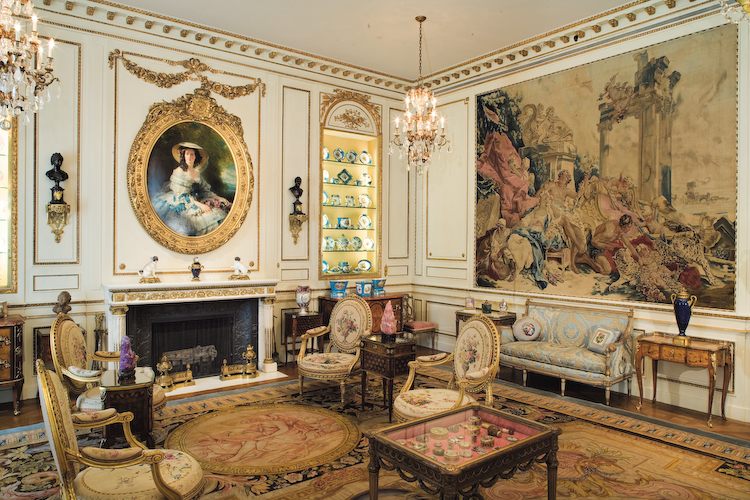 It is this particular room at Hillwood Estate that is decorated with many of the objects that Marjorie collected in the 1920s, the period in which she rallied to have her business merge with Birdseye Frozen Foods. This post isn’t long enough to give a sense of the rich, luxurious quality or the expansiveness of Post’s collection- it’s quite amazing. There are many other ways that the collection and estate relate to gender, femininity, and domesticity too (I didn’t even get to the estate gardens!). Has anyone visited Hillwood Estate? What was your impression of the place? In a phrase, Hillwood estate = death by pink. I’ve never been in a house (mansion, I should say) where I felt as smothered by decor as I did at Hillwood. The gardens, however, are absolutely beautiful: wild, overgrown (in a planned sort of way) and full of life. If I had lived at Hillwood Estates, I would have spent all my time in the gardens or the little Russian dacha. M, I’ve missed reading your blog! I’m glad you’re back. Back to the collection museums, I was lucky enough to finally visit The Huntington recently. Not as ornate as Hillwood, the house is lovely and had an amazing collection of British 18th C. portraits. I could have spent hours in the gallery with the full-length portraits. But then there’s also the American Art gallery, the Library, the Gardens – it was all kinds of paradise! I don’t remember there being as much pink as Kelly, but I LOVED Hillwood. My roommate volunteered there for sometime and so I got to hear some of her experiences. The gardens are absolutely beautiful and during the summers they often open up the grounds for movie nights. I specifically remember the movie room which I believe was made of velvet or something. It was one of my favorite places. but my favorite is Dumbarton Oaks in Georgetown. That place is heavenly especially the gardens in spring. Otherwordly. So glad you’re back at it! I loved your Halloween posts of past. Thanks for the comments! I’m glad to be back in the blogging world. Kelly, I’m so glad that went and subjected yourself to so much pink, if only so that you could also experience the gardens. I’m sure you really enjoyed yourself there. Val S., I’m glad to hear about your experience at The Huntington! I’m anxious to go there. The portrait collection sounds amazing! Thanks for the comment, Brittany! I bet your old roommate had a fun time volunteering at Hillwood. I forgot that Dumbarton Oaks is also in DC. Kelly, you should check it out sometime when you are near Georgetown. You might like it more than Hillwood! David and I went to Hillwood while they were hosting a special Soviet propaganda exhibit, which was really fascinating. The grounds are beautiful. I don’t like 18th century decorative arts at all but I do find the Guilded Age and the Progressive Era a very interesting time period. There’s this combination of repugnance and fascination for the psychology of the tastes of the upper crust of the time. (Yes, we are planning to visit the Hearst Castle soon.) It’s also fun to tour the house and see all the leading technology of the time period– for example, in the kitchen. And the museum does have a great collection of Russian orthodox vestments and icons. Historically, Merriweather Post is a fascinating figure. And who can really resist the image of her as an ambassador’s wife digging through second-hand stores in post-Revolution Russia finding incredible, beautiful, and/or historically significant objects? That’s super neat. Thanks for the comment, ego non! I bet you liked all of the Russian objects and icons! I’ve heard that the kitchen is a really interesting juxtaposition to the rest of the house, since it includes the latest technology (and modern feel) for the time period. What a contrast to all of the historical objects that Post chose to collect! P.S. Have fun visiting the Hearst Castle!